SDP is about making it easier for citizens to find, understand and use Victorian Government information. SDP is a project of the Digital Design and Innovation branch at the Department of Premier and Cabinet. Easily adaptable design components that allow customisation of look and feel. Go to https://ripple.sdp.vic.gov.au/ for full list of atoms, molecules, organisms and templates. Offers all available components to build a page. Currently used to build homepages, landing pages, and the bulk of content pages. News Display details of a news post. Grants Display details of a grant. Event Display details of an event. Ripple is the presentation layer, this is what people see as your website. Tide is the content management layer, built on Drupal 8. Bay is the infrastructure and hosting layer. SDP is managing its public code repository on GitHub. The Ripple Pattern Library shows how to use the design components for SDP. is an open-source hosting platform based on Lagoon. allows agencies to build, test and deliver websites via the cloud. Visit the Bay repository on GitHub. The vanilla offering includes all the SDP products, (Bay, Tide and Ripple). A digital agency is required to build the presentation layer. The government agency owns and manages its own content. SDP continually improves, maintains and supports the vanilla offering. development of the website. The use of Ripple is optional. A digital agency is required to build the presentation layer and any custom features in Drupal. The government agency owns and manages their own content. SDP will make updates available, although the government agency is responsible for improving, maintaining and supporting their own website. data classification above Public Unclassified. The SDP product roadmap provides an outline of what we're planning to deliver and when. 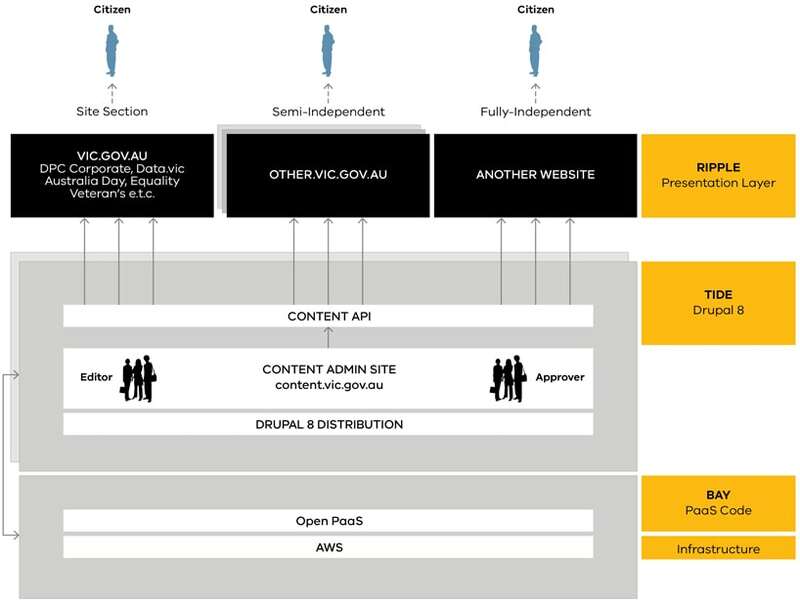 vic.gov.au is the online entry point to the Victorian Government. Victorian Aboriginal Heritage Council is an independent statutory authority that oversees registered Traditional Owners across Victoria. Buying for Victoria is the place to go for Victorian Government procurement. Victoria Police serves the Victorian community and upholds the law. Single Digital Presence (SDP) is an open, flexible technical solution that government agencies can use to reduce the cost and effort of digital development.